Panyembrama Balinese Dance is a secular dance form, become an alluring dance through a combination of the graceful movement, gamelan music, and elegant dancer’s costume. This dance is designed by I Wayan Berata and was performed for the first time in the Pandaan Festival, in 1971. 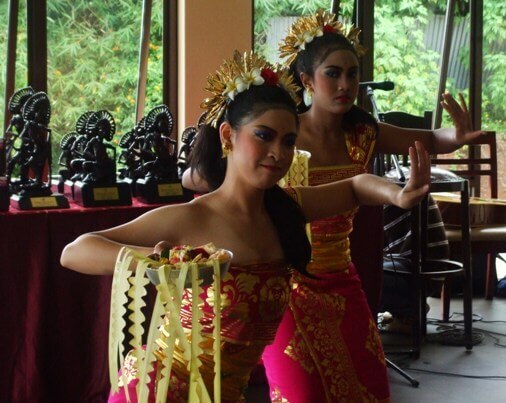 Panyembrama dance is performed by a group of skillful female dancers, accompanied by live music of Balinese gamelan. Even though the dance has no story to tell, it is considered to be extremely beautiful composition due to the dance movements are mostly used to welcome god into the temple. Costume and makeup plays an important role in dance performance. Panyembrama dancers use tapih cloth, kamen, and stagen belt (a long yellow colored with golden motifs scarves which bandages from waist to chest). And also a beautiful scarf with pattern of prada wrap the chest, with the cloth tip hanging through the shoulder to the back side. No headdresses are worn, but only golden flowers (gonjer), frangipani, and red flower. The dancers bring the "bokor", an engraved bowl made of silver or aluminum, decorated generously and filled with flower petals. In the entire dance, there is a prayer sequence and flower petals are scattered to the air or over the audience as an expression of welcome. During that time, in the late 1960s, there is a need for a secular dance (non-sacral contexts), which could be used outside of the temple or sacred ritual, so that sacred dances would remain in the temple. This is related to the controversy that dances devoted as Wali (sacred dance, performed in the innermost temple) and Bebali (semi-sacred dance, performed in the middle courtyard during a temple festival) should not be performed for tourists, or involved in any type of money-making activities. Then Panyembrama emerge, with movements and sounds inspired from the most important ceremonial dance such as: Legong, Condong, and Pendet. Panyembrama is derived from Balinese word "sembrama" which means "welcome". This reflects the purpose as a welcoming dance. Even so, over the time Panyembrama dance was taken back to the temple. Dibia, I Wayan; Ballinger, Rucina (Nov 27, 2012). 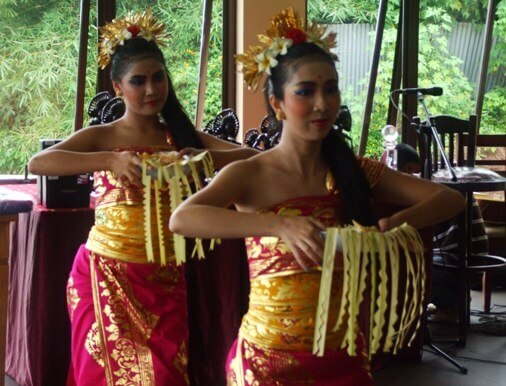 "Balinese Dance, Drama & Music: A Guide to the Performing Arts of Bali". Tuttle Publishing. Accessed on March 5, 2017. Heimarck, Brita Renée (2003). "Balinese Discourses on Music and Modernization: Village Voices and Urban Views". Psychology Press. Accessed on March 5, 2017. Laskewicz, Zachar (2003). "Music as Episteme, Text, Sigh & Toll: Comparative Approaches to Musicality as Performance". Zachar Alexander Laskewicz. Accessed on March 5, 2017.